Is Eric Schmidt right? Will developers prefer Android in 6 months? Is Eric Schmidt right? Will app developers prefer Android over iOS in 6 months? Yesterday at LeWeb in Paris, Google Chairman Eric Schmidt made some typically inflammatory comments about the future of Android and ‘the iPhone’. Specifically he said “Android is ahead of the iPhone now,” to an audience packed with tech entrepreneurs. Right out of the gate, Schmidt makes a cardinal error that seems to plague many who insist on comparing Google to Apple. He equates Android, the OS, with the iPhone, a device. But lets let that slide for the moment and assume that he was comparing Android to iOS, the platform that all of the Apple mobile devices run on. From physical vendors, Schmidt turned his attention to application vendors, or developers. Currently, iOS has an easy lead in application quality and developer support, but Schmidt says that this will be reversed within a few short months. The knee-jerk reaction is to call the comments ridiculous and blow them off. But lets take a look at what the numbers say. It turns out that Schmidt isn’t completely blowing smoke. There is definitely a demand for apps on the Android platform, and in fact, there are signs that the demand for apps on an individual basis (per Android device) has grown over the past few months. Just earlier this week, Google reported that 10 billion apps had been downloaded from the Android Market, a number that is below Apple’s 18 billion, but on par with its pace of around 1B a month. The massive growth of the platform’s app downloads likely has a lot to do with the fact that there are 550,000 Android phones activated every day, with a total of 130M devices as of July and 190M in October. During the Q2 earnings call in July, Eric Schmidt said that about 6B apps had been downloaded. That’s where the 1B downloads a month metric comes from. Obviously more than 190M devices are now on the market, in fact, Schmidt said at LeWeb that the number was ‘about 200 million’. Using those numbers, we can estimate that there is somewhere around 50 apps on average installed per Android device. This is up somewhat from the 46 per device in July, but only by 8.7%. By comparison, iOS users downloaded 83 apps per device in 2011. Of course, all of those downloads don’t necessarily mean dollars. In fact, according to a report from at the beginning of September, the share of paid apps on the Android Market remained at 35% mark. This is backed up by current statistics from AndroidLib, which put it closer to 31%. By comparison, the percentage of paid apps on the App Store was recently estimated at only 18%, with 82% being free. Unfortunately, this still leaves would-be Android developers with a narrow window in which to make money. Recent estimates by Piper Jaffray’s Gene Munster put Android Market sales of paid apps at just 1.3% of overall apps downloaded. As far as average selling price of Android apps, Munster’s estimated ASP of an Android app is $3.79, while 148Apps puts iOS apps at $2.16. This would seem to be a bit of a win for the Android platform, but also consider that there are (roughly) 300k apps on the Android Market, while there are a little over 500K on the App Store. The difference in sheer numbers probably accounts for some of the dip in price, while the lower amount of paid apps altogether likely allows for more price compression at the higher end of the pricing spectrum on Android. To put it simply, there isn’t much of a market for paid apps on the Android Market, but decent apps can charge a decent amount and still get snapped up — much as heftily priced food presented to a starving man. 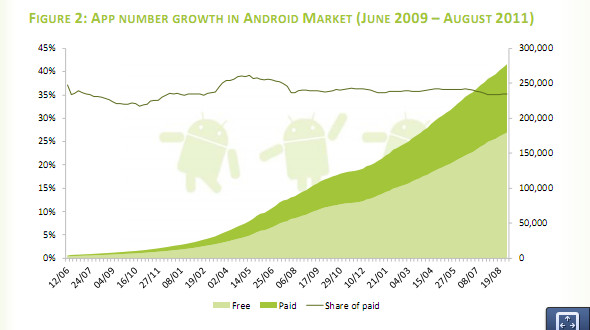 It is important to remember that $341M is still a lot of money, so there is a living to be made on Android. Unfortunately, it’s just a much smaller percentage of developers that get to make that living. Tablets are probably the biggest problem with Schmidt’s proclamations. At this point, the iPad is dominating the tablet market without prejudice, Android tablets are failing to gain a toehold and there are few signs that this will change in the future. The Kindle Fire is a different beast entirely. Backed by Amazon and its retail prowess it’s already making some sales waves and looks to become the second really successful modern tablet. It appears to be eating up a swath of the market that may have gone to future Android tablets, but not the iPad. But will developers flock to the Kindle Fire? This could definitely be counted as a net win by Schmidt, as the Fire does use Android. This would be disingenuous, as the version of Android that the Kindle Fire uses is useless to Google in almost every way (aside from web services), but it would be correct. In a very, very agressive move, Amazon even intercepts clicks on Google Android Market links and redirects users to its own app store instead, depriving Google of any profit for those apps. Unfortunately, Amazon isn’t known for its developer friendly stance. It has come under attack several times in recent memory for the way that it handles developer relations and app promotions on its proprietary Android Market. Not only that, but the 7″ form-factor is largely unproven and may need some severe customization by developers to actually make it usable. This may deter many developers from porting an application over that is engineered to present a precise experience to the user (we call these good apps from decent developers). The Kindle Fire is also very much a placeholder device that exists only so that Amazon could have something out for the holiday season. Many developers will likely wait until the sales numbers of the Fire show it to be sticking around, or until the second iteration of the device rolls out next year. Not to mention the fact that the Kindle Fire is very much a focused media-consumption device, which doesn’t lend itself to being a fertile ground for app purchases. People will likely use it more to consume Amazon content, which is exactly what it was designed to do, and less to play games or use cool apps. Schmidt quoted Google’s new Ice Cream Sandwich update as one of the reasons that developers would soon be flocking to Android from iOS and other platforms. By all accounts, ICS is easily the best version of Android out there and may truly be the edition that moves it out of the ‘almost there’ column to the ‘you can use it without feeling frustrated’ column. But does that mean that developers will want to code for it? It depends. It’s definitely easier for those who have coded using web technologies and then wrapped their code in native UI elements. But for many developers of class A products, that’s not an option. Instead, they will have to rebuild their app utilizing the design conventions of Android and tweaking for its remaining weaknesses, like scrolling and zooming. There is also the fact that the fractured landscape of Android offers little to like for developers that are coming from the laser-focused world of iOS. So, is the Android Market improving as a viable place to sell apps for money? Sure, a bit. But you’re still facing a market where most people don’t want to pay for most of the apps that they download, even if they are willing to shell out more for the few that they do buy. And we haven’t even touched on the development issues that still exist in Android. A huge array of devices on various versions of the OS, with odd screen sizes and hardware limitations. A market that seems willing to let itself be overrun with malware and cheap copies of paid apps. iOS comes out looking like a far better place to sell apps. Once again, this could exclude freemium, but if a developer is not in that market then there needs to be some really serious questions asked about whether or not the product can differentiate itself enough to make it into the top few percent of Android apps that actually make decent money. In the end, if developers do their homework, there is really nothing that indicates that Android will suddenly become a better place than iOS to do business in the next six months. There may be some developers who find a niche to slice. But as far as it becoming the focus of efforts, the place that an app gets pushed first, there is little to recommend it yet. That means that Schmidt’s statements appear to carry little weight beyond bluster at this point, unless something about Ice Cream Sandwich just blows the doors off of the market, which seems unlikely. 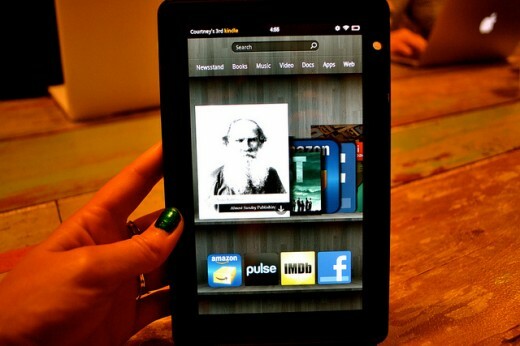 This article has been updated to clarify statements about how Google stands to profit from the Kindle Fire. Read next: Amazon signs deal with mobile payment specialists Bango, operator billing incoming?